A Norfolk Wildlife Trust Site, Happy Valley is nestled in 9 acres of whimsical woodland and open space. If you're looking for a rural glamping holiday, this countryside venue in Norfolk has much to offer. Our unique valley is teaming with wildlife throughout the fir woodland and features its own bridged island set on a pretty little lake. Our mix of shepherd's huts, tree temples, bell tents and luxury woodland lodge offer flexible, luxury glamping for all tastes. A wood-fired hot tub is available to book during your stay. Toad Hall our newest luxury lodge has a private hot tub, underfloor heating, wet room, king size accommodation and is part disable friendly. A disable friendly treehouse yes! We also cater to larger events including weddings, parties and gatherings of all kind. Just drop us a line and we'll help bring your vision to life. 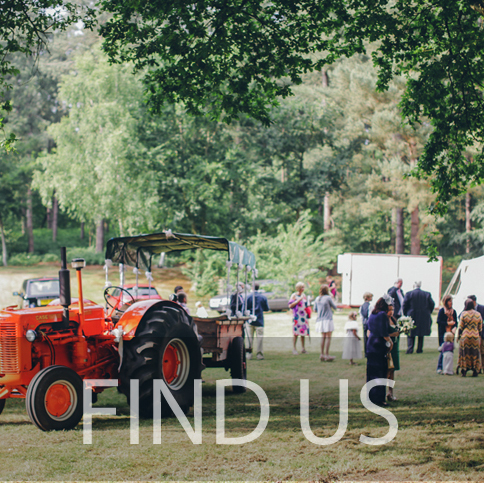 Whether it's a woodland wedding, rustic barn dance, yoga retreat or mini festival, we can cater to all. "We", consist of Scott, master craftsman, maker of all cabins. Me, Katy, I'm a mumma, fashion editor and freelance stylist and have a little vintage shop (Vintage Deli) as well as hostess/cleaner/laundrette at Happy Valley. We have 2 bambinos, Barnaby and Annie. We are a small family business and are evolving the site to eventually cater for all your desires. In the meantime we invite you to enjoy a little bit of luxury at Happy Valley and experience its magic. Happy Valley is what my grandfather called this part of the farm. He felt the magic here and passed down his knowledge of ancient burial grounds, glaciers, the magnetic fields on the lay of the land and natural springs. It explains why this part of the county has a special place in ours and many others hearts.